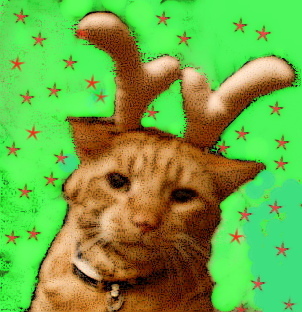 My artistic collaborator and Feline companion Plumpton extends Season’s Greetings to everyone and hopes that you all find a dead mouse in your stocking on Christmas morning. I think I’ll pass on that one, Plumpton. So, while I’m checking my shoes and checking them twice, have fun watching the movie I took of the Holiday Show playing in the lobby of the Comcast Center in Philadelphia.